Tamarind and Thyme: The Soup Era. We’ve been making and drinking quite a lot of soup. This recipe was suggested by my food-loving French colleague and apparently it’s quite the classic in France. I’m a big fan of both courgettes and La Vache Qui Rit (that’s Laughing Cow here in the UK) and it sounded right up my street. And it was! It was very comforting and ridiculously easy to make. My courgettes are all gone now – I’ve just ripped up the plants – but I’ve noticed lots still in the shops that would be perfect for this. This one’s easy! If you feel the courgette skin is too bitter, peel some of it off; I left mine and my soup turned out fine. Cut up your courgettes into small chunks and dump them into a pot. Cover with 800ml water and the bouillon and bring to a boil. Reduce the heat and simmer until the courgettes are tender. Add the cheese and stir through until incorporated. 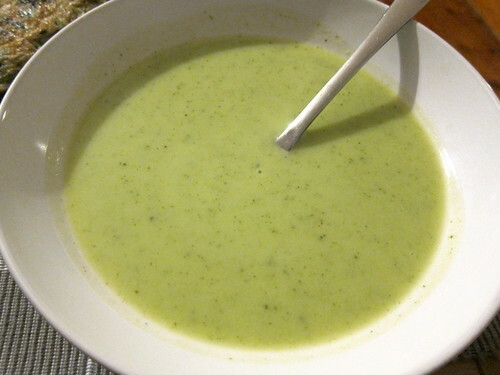 Whizz the soup with a blender until smooth and then salt and pepper to taste. Keep hot until ready to serve. You are correct! Very embarrassing! 😀 Thank you and it’s now corrected. Considering the delightful cheese, do you think this will this taste the same substituting zucchini for courgettte? For sure! In the UK, we call zucchinis courgettes!